2018 Lexus RX Trim Levels with Comparisons & Configurations. What 2018 Lexus RX Trim Level Should you Buy? What is the Difference Between the Trims? When Lexus went to redo their mid-size Lexus RX crossover for the 2016 redesign, they decided that they wanted to create a luxury crossover that could do everything. They certainly succeeded, as the new Lexus RX was improved across the board, from new aggressive styling, to an efficient optional Hybrid powertrain, to new technologies, more space, and better performance. For almost any kind of luxury crossover shopper, the Lexus RX offers something to get excited about. Like all Lexus models, the 2018 Lexus RX uses a slightly different set of trim level designations than most other automakers. Instead of subdividing them by their features, the six versions of the Lexus RX are different in their fundamental functions, but mostly offer the same standard and optional equipment, with a few differences. The standard and the hybrid model both consist of three trim levels each, covering the standard configuration, a long wheelbase one, and a performance-oriented model. This guide takes a close look at all of these different versions of the Lexus RX, giving buyers information of what features each one adds to the lineup, whether they be standard or optional, and how that selection differs between the different trims. 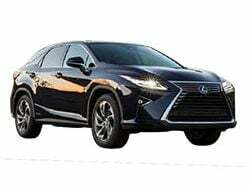 Compare the 2018 RX 350 vs 350L Trims. What is the difference? The standard configuration of the Lexus RX - and the other most people are likely to choose - is the RX 350. The 350 comes with the standard V-6 engine making 295 horsepower and two rows of seating for a total of five seats. As all luxury crossovers, it comes with a nice set of equipment, including leatherette upholstery, power front seats, dual-zone climate control, smart key with push-button start, and an 8-inch touchscreen infotainment system. The system is Bluetooth capable, and also has two USB ports and satellite radio support. It also serves as the screen for the standard rearview camera. Other safety features that are included in the standard 350 package are automatic high beams, adaptive cruise control with a forward collision warning and pedestrian detection, and a lane departure warning with lane keep assist. Automatic transmission and front-wheel drive are standard, but all-wheel drive is available. On top of these basic features, the Lexus RX 350 can be equipped with a full array of options. The Premium Package adds leather upholstery, interior wood trim, power-folding auto-dimming side view mirrors, and driver’s seat memory. The Cold Weather Package adds a windshield wiper de-icer, a fast-response interior heater, headlight washers, rain-sensing windshield wipers, and auto-leveling headlights. The Towing Prep Package prepares the RX for towing. The Navigation package adds a larger 12.3-inch infotainment screen with built-in navigation and a 12-speaker Lexus sound system. Or for a bit more, it is possible to get the Navigation/Mark Levinson Premium Audio Package, which also includes the navigation and the larger screen, but instead combines it with a 15-speaker Mark Levinson sound system. The Luxury Package is the heftiest one, and it includes 20-inch wheels, semi-aniline perforated leather, wood and brushed aluminium accents, a heated steering wheel, and both heating and ventilation for the front seats. It is mutually exclusive with the Premium package: only one or the other can be added to a vehicle. In addition to the packages, many of the options included in them are also available individually, with some additions. Heated front seats, heated and ventilated front seats, or heated and ventilated front seats with heated rear seats are all available individual options for example. Options that are not a part of a package that can be added include both a regular-size and panoramic moonroof, a blind spot monitoring system with parking assistance, a hands-free liftgate, a heads-up display, LED headlights, and a surround-view camera. The 350L is the long wheelbase version of the Lexus RX. This allows it to seat up to seven people, thanks to the added third row, though even with the longer wheelbase that does cut into the available storage space. The equipment is otherwise very similar to the regular RX 350, with a few exceptions. The leather interior is standard on the 350L, rather than a part of the Premium package. Instead, the Premium Package bundles in a moonroof to compensate, and is also slightly less expensive. Because of this, a moonroof is not available as a standalone addition on the 350L, and neither is the panoramic moonroof option. The 350L also is equipped with standard features designed to make living with a third row easier. The power liftgate is standard, and the third row has a power folding function. There are also dedicated climate control functions just for the third row. The 350L is about $4,000 more expensive to start with than the regular RX 350, but it comes with additional seating functionality and standard leather. Its Premium Package, which is likely a must-have for almost all buyers, is significantly cheaper, and also comes with a moonroof. For families that need all three rows of seating and don’t want to upgrade to a full-size luxury SUV, the 350L is a good deal. For those who are content with two rows though, the normal 350 is a more attractive proposition. Compare the 2018 Lexus RX 350 vs 350 F Sport Trim Levels. What is the difference? F Sport is the Lexus code name for their performance-oriented models. It uses the same V-6 as the other 350 RX models, but it has a number of improvements that give it the look and feel of a more sporty car. It comes with its own interior and exterior design, as well as special sport wheels. Inside, it provides the driver and the front passenger with sport seats and a steering wheel with paddle shifters. The steering wheel is also replaced with a sport version, and is heated and trimmed out in perforated leather. There is also a variable suspension system with an additional sport driving mode, and a vehicle dynamics management system. The F Sport also comes standard with a number of high-end options from the other two trims, such as heated and ventilated seats, driver’s seat memory, and auto-dimming heated side mirrors. Aside from those features, the F Sport otherwise offers the same set of options and packages as the other two 350 models. The F Sport is a fun take on the more luxury-focused RX 350, but it does not add additional power. It is a little more responsive and feels slightly more agile, but drivers should not expect it to feel too different from the base models. It is significantly more expensive than the regular RX 350, and slightly more than the 350 L, but comes with enough standard features that at the end of the day the price difference is fairly minimal. Compare the RX 350 vs 450h Trims. What is the difference? The RX 450h is the equivalent of the RX 350, but with the Atkinson-cycle hybrid powertrain. The hybrid is actually slightly more powerful at 308 horsepower, and comes exclusively with all-wheel drive. And, of course, it gets much better fuel economy. Despite all of that, it may not seem to be significantly more expensive than the regular all-wheel drive 350 - roughly $1,000 more in starting price. That is misleading however. The 450h comes with almost identical equipment and package options to the 350, but it does not come in a basic model. All 450h cars produced are made with either the Premium Package or the Luxury Package already added. Aside from that change, the 450h also offers bi-LED headlights with the Adaptive Lighting System as a standalone option that is not available on the regular RX 350. Aside from its lack of availability in a base configuration or front-wheel drive, the upgrade to the hybrid 450h gives drivers a lot of value for the added cost. Anyone considering an all-wheel drive RX with at least the Premium package should give the 450h a try, as aside from a slightly higher price it offers practically no drawbacks. Compare the RX 450h vs 450hL Trim Levels. What is the difference? The 450hL is the hybrid version of the regular 350 L model. Like the regular 450h, it is exclusively available in all-wheel drive, but otherwise it has all of the same standard and optional features as the regular 350 L. It is a little more expensive to upgrade to the 450hL from the 450 than it is to upgrade from the 350 to the 350 L, but otherwise the two trim levels are fairly identical in the role that they play in the hybrid and the non-hybrid lineup. Just like the 450h is a strong alternative to the regular RX 350, the 450hL can be a good choice for those who need the third row of seating. Due to the slightly higher price, it is not as significant of a value compared to the regular 450h, but it definitely bears considering for anyone who would like a seven-seat version of the Lexus RX. Compare the 2018 Lexus RX 450h vs 450h F Sport Trims. What is the difference? Rounding out the lineup of the available Lexus RX options, the 450h F Sport is the 450h with the added F Sport package. It has mostly the same styling as the 350 F Sport, and is pretty much identical to that model in all respects. It is the most expensive of the Lexus RX models, but it is also the least expensive hybrid upgrade. It costs less than $1,000 to step up to this model from the regular all-wheel drive F Sport. Thanks to the higher power output and the more conservative transmission tune of the hybrid RX variants, the added F Sport options actually make a bigger difference in handling and performance than they do on the regular F Sport. For the sportier luxury buyers, this can be a great option, especially as it is only marginally more expensive than the 350 F Sport. Thanks to their modular options and packages, almost the same equipment is available - and at roughly the same price - between all six of the different 2018 Lexus RX trim levels. The choice between them is then primarily down to the kind of functionality that buyers want from their car. The most popular option is the base RX 350, as it is the most customizable and least expensive. The 350 L is a decent option for those who want or need two extra seats, while the F Sport adds a little extra performance feel to the model. For those who would like to save a little on gas or get a little extra horsepower, the 450h, 450hL, and 450h F Sport offer the same functionality, but with all-wheel drive and a hybrid powertrain. All of them are equally spacious, comfortable and luxurious, so it is difficult to go wrong in the selection process.